Esports has always been plagued by Visa issues. 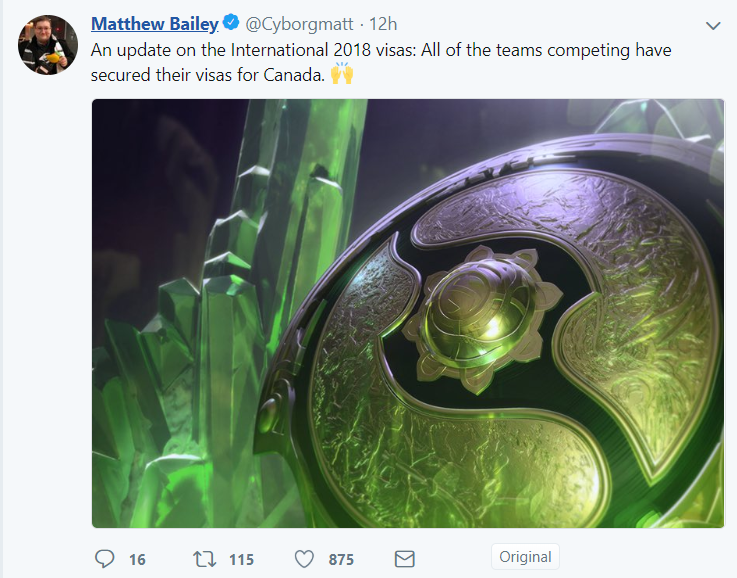 One of the biggest downsides of not being a mainstream sport is the fact that Immigration officials are often hesitant to give out visas to aspiring Dota 2 professionals. TI5, TI6 and even TI7 saw multiple players miss out on the event, as they just weren’t able to successfully secure Visas which would allow them to compete in the Key Arena. In fact, Multiple woes struck then Team Empire carry Vladimir "Chappie" Kuzmenko and talent Henrik "AdmiralBulldog" Ahnberg last year. Team Empire was forced to fly to Seattle for The International 2017 without Chappie since the US Consulate didn’t approve his passport in time. Meanwhile, AdmiralBulldog was barred to enter the US after failing to provide the correct Visa. Of course. All the visas are above board and the teams are getting the support they need. So, for the first time in quite a while, we will have all 18 teams in their entirety, compete for the Aegis of Champions. Who are your rooting for this year?